Last night, had the opportunity to sit down with some test gear and run the KN-Q7A 40M txcvr thru it ‘s paces. At the moment, the only modification from stock that I have done is to replace T3 toroid in the output stage. Having access to a 2-tone generator, calibrated signal source and spectrum analyzer, power meter and dummy load was what we used for the testing. Silly me, did not get any screen-shots of the output. Basically, we did a 2-tone test, minimal discernible signal, IF bandwidth, spurious output. Adjusted the level of the tones until the output power peaked – and it peaked right at the 13W mark. We left it key-down into a dummy load for around 10-15 minutes – which is far more brutal than any real-world use will ever be! The Final did of course warm up a bit- was certainly warm but not so hot that you could not touch it with your finger. 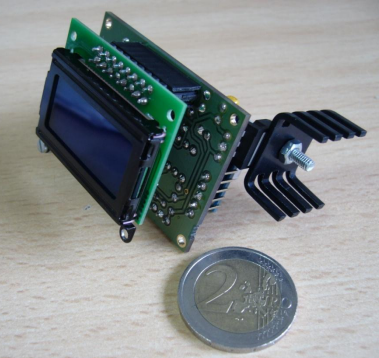 The whole case (heatsink) did increase in temperature, showing that the design is quite adequate. We took a look and found that the output was not that clean! It took a little bit of trimming of the BFO to improve things, and once sorted out, it looked like the IMD at it’s worst – which was when we dropped the input level so that the output power was around the 10W mark. It was at about -23db. While not brilliant, nowhere near as bad as what others have reported. The odd thing was that there is a very “sweet spot” when it was driven pretty hard and at full output power, we saw the IMD drop right down to around -30db! Yes, at full output power, the signal was a lot cleaner than at all lower levels. The Worst case was in fact -mid-power – right in the area where normal voice would be. This pretty much confirms that I need to go ahead and build a compressor before feeding the audio into the 602 Mixer – a mod I had actually planned on doing. We used a reference level signal generator and set it to about 7.090, tuned the rx to it. Then it was simply a case of tweaking the RX until the tone was mid-range in the bandpass filter then lowering the level. Surprisingly good is what I would say here! a CW tone was easily heard way down at around -124dbm! beyond here it was noticeable for another 2db, but all gone and nothing heard at all at -127dbm. Lets look at -124dbm – that is 0.14uV and that makes it a pretty hot RX! My “gut feel” that it was a good rx was totally confirmed. Pumping in a CW signal at 7.095, at -90dbm level then tuned the RX to it. Then by listening to the output, the signal was varied up/down in 100hz steps. It was dead easy to show that the B/W if the IF Xtal filter is as I had already determined is 1.8khz wide, with a very clean, response with a slight roll-off at the 100hz mark on each side. I wish that my other commercial gear was as good to tell the truth! -90db signal level gave us 35db over the minimal level, so that all we can say is that at 1.8khz, the filter is better than 35db. Didn’t think to try this at a higher level to determine how steep and sharp the filter is, but in the real world it is certainly good! Well this is where it got a little interesting – and yes there were a few bumps along the way. First off, the 2nd, 3rd, 4th and 5th order harmonic outputs. 2nd was at about -63db, 3rd was at -68db, 4th was at -72db and 5th was at -80db. Could not determine if there was any higher orders as they were in the noise floor. 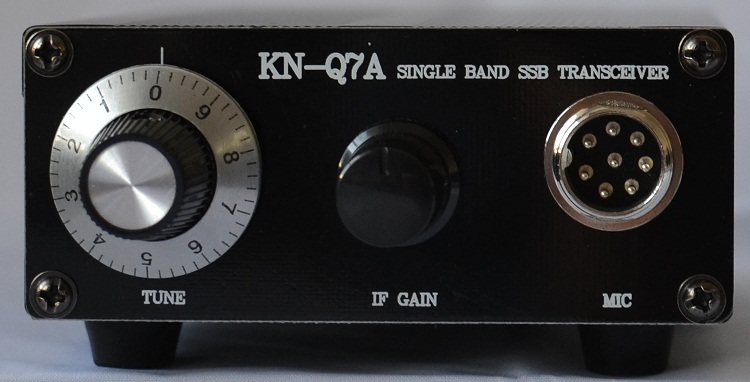 Given that on 40M the 2nd, 3rd and 4th fall into other Amateur bands, this is not going to cause any interference – especially when you look at the levels! -63db with a 13W output is way down at 7 micro watts! Now the VFO/BFO products. this is where things were not quite as clean! There were 3 obvious products – 1.3Meg, 5.8Meg and 8.4Meg. If you look at the IF frequency then these all make sense! The 2 that were +- 1.3Meg from the signal were around the -45db mark and the one at 1.3Meg was down a little more – at about -48db. Rather than a simple low-pass filter on the output, a better band-pass filter that is reasonably tight would be needed to knock these unwanted products down a bit more. Finally, lets pull the “specs” and compare them to what we actually measured! My kit was the Mar 2014 Rev D PCB V2.2 with the IRF530 FET as the final. Now, in all of this testing, the only adjustment that was made was the BFO trimmer, all other tuning was left as it was from my initial tuning. Truth be known, a little bit of tweaking could have possibly seen some further improvements, but that was not the point – it was to look at what was going on by doing nothing more than following the tuning steps – which is exactly what anyone building the kit would have done. Lets face it, all in all, for a transceiver that costs only a bit over $100, this is really quite impressive! Yes, doing these measurements and now having something to go on shows me that this design if advanced just a little more could move it from pretty good to excellent! From a pure usability perspective, adding a “tune button” – resistor to gnd + bypass cap on the NE602 to un-balance it and give around 2W out would be nicer than having to do the whole whistle/tune thingy! Adding the compressor stage and and AGC to improve both TX and RX experience and finally, a little more output filtering would take this from a good to a great transceiver. Now, I am going to get on and build the DDS to give me a tad more band coverage, built an audio compressor stage, another Audio out stage with AGC myself over the coming weeks, that is of course, between getting lots of use out of this little rig!